The following describes the terms on which ChemCenter offers you access to our services. This Agreement is effective on June 1st, 2007 for current users, and upon acceptance for new users. Use the site and its services if you are under 18 years old, cannot from legally binding contracts or you are suspended from ChemCenters' site and services. Post products or any content in an inappropriate category or areas on the Site. Violate any laws, third party rights, or our policies such as the Prohibited and Restricted Items policies. Fail to deliver payment for items purchased by you, unless the seller has materially changed the item's description after you ordered, a clear typographical error is made, you cannot authenticate the seller's identity or you used your right to cancel the order during the next 2 business days from purchase. Fail to deliver items purchased from you, unless the buyer fails to meet the posted terms, you cannot authenticate the buyer's identity or you used your right to cancel the order during the next 2 business days from purchase. Manipulate the price of any item. Circumvent or manipulate our fee structure, the billing process, or fees owed to ChemCenter. ChemCenter expects that the buyer will not bypass the web when he is doing business with the same suppliers with whom he made business with before purchasing through the web. In any case, the supplier will inform the buyer that the next contractions will be made under the auspices of ChemCenter. Transfer your ChemCenters account to another party without our consent. Distribute viruses or any other technologies that may harm ChemCenters, or the interests or property of ChemCenters users. Copy, modify, or distribute content from the Site and ChemCenter's copyrights and trademarks; or harvest or otherwise collect information about users, including email addresses, without their consent. ChemCenter works to keep the site working properly. Please report problems, offensive content, and policy violations to us. Joining ChemCenter and ordering listed items is free. We do charge fees for using other services, such as listing items. When you use a service that has a fee you have an opportunity to review and accept the fees that you will be charged based on our Fees schedule, which we may change from time to time. Changes to that Policy are effective after we provide you with at least fourteen days' notice by posting the changes on the Site. You will not hold ChemCenter responsible for other users' actions or inactions, including things they post. You acknowledge that ChemCenter is not an 'auctioneer. Although we may be referred to as an online auction website, it is important to realize that we are not a traditional auctioneer. Instead, the Site is a venue to allow anyone to sell and buy specified products, at anytime. We are not involved in the actual transaction between buyers and sellers. We have no control over and do not guarantee the quality, safety or legality of items promoted, the truth or accuracy of listings, the ability of sellers to sell items, the ability of buyers to pay for items, or that a buyer or seller will actually complete a transaction. We do not transfer legal ownership of items from the seller to the buyer, and nothing in this agreement shall modify the governing provisions, under which legal ownership of an item is transferred upon physical delivery of the item to the buyer by the seller. Unless the buyer and the seller agree otherwise, the buyer will become the item's lawful owner upon physical receipt of the item from the seller. Further, we cannot guarantee continuous or secure access to our services, and operation of the Site may be interfered with by numerous factors outside of our control. Accordingly, to the extent legally permitted, we exclude all implied warranties, terms and conditions. We are not liable for any loss of money, goodwill, or reputation, or any special, indirect, or consequential damages arising out of your use of our Site. Some jurisdictions do not allow the disclaimer of warranties or exclusion of damages, so such disclaimers and exclusions may not apply to you. Regardless of the previous paragraph, if we are found to be liable, our liability to you or to any third party is limited to the greater of the total fees you paid to us in the 12 months prior to the action giving rise to the liability. If you have a dispute with one or more users, you release us (and our officers, directors, agents and employees) from claims, demands and damages (actual and consequential) of every kind and nature, known and unknown, arising out of or in any way connected with such disputes. Much of the information on the Site is updated on a real-time basis and is proprietary or is licensed to ChemCenters by our users or third parties. You agree that you will not use any robot, spider, scraper or other automated means to access the Site for any purpose without our express written permission. Take any action that imposes or may impose (in our sole discretion) an unreasonable or is proportionately large load on our infrastructure. Copy, reproduce, modify, create derivative works from, distribute, or publicly display any content (except for Your Information) from the Site without the prior expressed written permission of ChemCenters and the appropriate third party, as applicable. Interfere or attempt to interfere with the proper working of the Site or any activities conducted on the Site; or other measures we may use to prevent or restrict access to the Site. You will indemnify and hold us (and our officers, directors, agents, and employees), harmless from any claim or demand, including reasonable attorneys' fees, made by any third party due to or arising out of your breach of this Agreement, or your violation of any law or the rights of a third party. Except as explicitly stated otherwise, legal notices shall be served to the email address you provide to ChemCenters during the registration process (in your case). Notice shall be deemed given 24 hours after email is sent, unless the sending party is notified that the email address is invalid. Alternatively, we may give you legal notice by mail to the address provided during the registration process. In such case, notice shall be deemed given three days after the date of mailing. If a dispute arises between you and ChemCenter, our goal is to provide you with a neutral and cost effective means of resolving the dispute quickly. Accordingly, you and ChemCenter agree that we will resolve any claim or controversy at law or equity that arises out of this Agreement or our services (a "Claim") in accordance with one of the subsections below or as we and you otherwise agree in writing. Before resorting to these alternatives, we strongly encourage you to first contact us directly to seek a resolution. We will consider reasonable requests to resolve the dispute through alternative dispute resolution procedures, such as mediation or arbitration, as alternatives to litigation. Law and Forum for Disputes - This Agreement shall be governed in all respects by the laws of the State of Israel as they apply to agreements entered into and to be performed entirely within Israel between Israeli residents, without regard to conflict of law provisions. You agree that any claim or dispute you may have against ChemCenter must be resolved by a court located in Tel Aviv, Israel, except as otherwise agreed by the parties or as described in the Arbitration Option paragraph below. You agree to submit to the personal jurisdiction of the courts located within Tel Aviv, Israel for the purpose of litigating all such claims or disputes. Arbitration Option - For any claim (excluding claims for injunctive or other equitable relief) where the total amount of the award sought is less than $4,000, the party requesting relief may elect to resolve the dispute in a cost effective manner through binding non-appearance-based arbitration. In the event a party elects arbitration, they shall initiate such arbitration through an established alternative dispute resolution ("ADR") provider mutually agreed upon by the parties. The ADR provider and the parties must comply with the following rules: a) The arbitration shall be conducted by telephone, online and/or be solely based on written submissions, the specific manner shall be chosen by the party initiating the arbitration. b) The arbitration shall not involve any personal appearance by the parties or witnesses unless otherwise mutually agreed by the parties. c) Any judgment on the award rendered by the arbitrator may be entered in any court of competent jurisdiction. Improperly Filed Claims - All claims you bring against ChemCenter must be resolved in accordance with this Resolution of Disputes Section. All claims filed or brought contrary to the Resolution of Disputes Section shall be considered improperly filed. Should you file a claim contrary to the Resolution of Disputes Section, ChemCenter may recover attorneys' fees and costs up to $1500, provided that ChemCenter has notified you in writing of the improperly filed claim, and you have failed to promptly withdraw the claim. 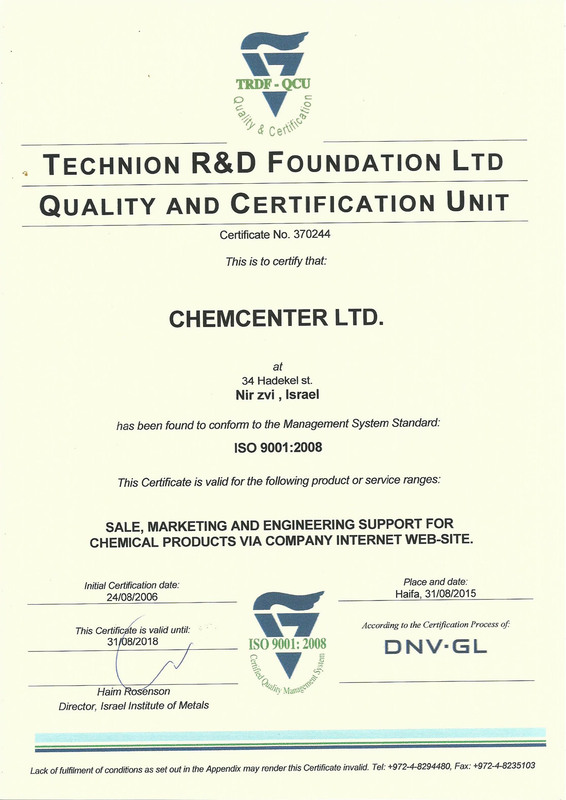 ChemCenter is located at Moshav Nir Tzvi, Israel. If any provision of this agreement is held to be invalid or unenforceable, such provision shall be struck and the remaining provisions shall be enforced. In our sole discretion, we may assign this agreement in accordance with the Notices Section. Headings are for reference purposes only and do not limit the scope or extent of such section. Our failure to act with respect to a breach by you or others does not waive our right to act with respect to subsequent or similar breaches. We do not guarantee we will take action against all breaches of this agreement. We may amend this Agreement at any time by posting the amended terms on the Site. Except as stated elsewhere, all amended terms shall automatically be effective 30 days after they are initially posted on the Site. Additionally, we will notify you through email message. This Agreement may not be otherwise amended except in a writing signed by you and us. This Agreement sets forth the entire understanding and agreement between us with respect to the subject matter hereof. The following Sections survive any termination of this Agreement: Fees and Services (with respect to fees owed for our services), Release, Content License, Liability, Indemnity and Resolution of Disputes. You may report complaints to us by contacting us in writing or by telephone - see Contact Us. You can browse the Site without telling us who you are or revealing any personal information about yourself. Once you give us your personal information, you are not anonymous to us. If you choose to provide us with personal information, you consent to the transfer and storage of that information to our servers located in the State of Israel. E-mail address, physical contact information, and (depending on the service used) sometimes financial information, such as credit card or bank account numbers. Transactional information based on your activities on the Site (such as buying, selling, item and content you generate or that relates to your account). Shipping, billing and other information you provide to purchase or ship an item. Chats, dispute resolution, correspondence through the Site, and correspondence sent to us. Computer sign-on data, statistics on page views, traffic to and from the Site, and ad data. Other information, including IP address and standard web log information and supplemental information from third parties. (For example, if you incur a debt to ChemCenter, we will generally conduct a credit check by obtaining additional information about you from a credit bureau, as permitted by law. As another example, if the information you provide cannot be verified, we may ask you to send us additional information ,such as your driver license, credit card statement, and/or a recent utility bill or other information confirming your address, or to answer additional questions online to help verify your information.). We don't sell or rent your personal information to third parties for their marketing purposes without your explicit consent. We may combine your information with information we collect from other companies (such as demographic data) to improve and personalize our services. If you don't wish to receive marketing communications from us, simply send us email that indicates your preference. Prevent potentially prohibited or illegal activities, and enforce our User Agreement. Customize, measure, and improve our services and the Site's content and layout. Members of our corporate family to help detect and prevent potentially illegal acts and provide joint services. Law enforcement or other governmental officials, in response to a verified request relating to a criminal investigation or alleged illegal activity (In such events we will disclose name, city, state, telephone number, e-mail address, User ID history, fraud complaints, and bidding and listing history.). Our Site enables you to share personal and financial information in order to complete transactions. We encourage you to disclose your privacy practices and respect the privacy of other users. We cannot guarantee the privacy or security of your information and therefore we encourage you to evaluate the privacy and security policies of your trading partner before entering into a transaction and choosing to share your information. To help protect your privacy, we allow only limited access to other users' contact, shipping and financial information in order to facilitate your transactions. When users are involved in a transaction, they may have access to each other's name, User ID, e-mail address, and other contact and shipping information. In all cases, you must give other users a chance to remove themselves from your database and a chance to review what information you have collected about them. ChemCenter - transaction-related purposes that are not unsolicited commercial messages. Using services offered through ChemCenter. We and our users do not tolerate spam. You are not licensed to add other ChemCenters users, even a user who has purchased an item from you, to your mailing list (email or physical mail) without their express consent. To report ChemCenters-related spam or spoof emails to ChemCenters, please forward the email to admin@ChemCenters.com. You may not use our communication tools to send spam or otherwise send content that would violate our User Agreement. We automatically scan and may manually filter messages to check for spam, viruses, phishing attacks and other malicious activity or illegal or prohibited content, but we do not permanently store messages sent through these tools. If you send an email to an email address that is not registered in our community (via Tell-a-Friend or other tools), we do not permanently store that email or use that email address for any marketing purpose. We do not rent or sell these email addresses. Your password is the key to your account. Use unique numbers, letters, and special characters and do not disclose your ChemCenter password to anyone. If you do share your password or your personal information with others, remember that you are responsible for all actions taken in the name of your account. If you lose control of your password, you may lose substantial control over your personal information and may be subject to legally binding actions taken on your behalf. Therefore, if your password has been compromised for any reason, you should immediately notify ChemCenter and change your password. You can see, review and change most of your personal information by logging into the Site. Generally, we will not manually modify your personal information because it is very difficult to verify your identity remotely. You must promptly update your personal information if it changes or is inaccurate. We do retain personal information from closed accounts in order to comply with law, prevent fraud, collect any fees owed, resolve disputes, troubleshoot problems, assist with any investigations, enforce our ChemCenter User Agreement, and take other actions otherwise permitted by law. ChemCenter will not allow any deal to be made with a country or organization which has been defined by International law as a terrorist country or organization. In this case, ChemCenter will have the full authorization to stop and cancel any connection with these entities through the web. Sudan, Libya, Cuba, Iran, Iraq, North Korea, Syria. Hizballah, Hamas, Jihad, Al Qa'ida etc. In order to improve the services and the web site, sometimes ChemCenter has to shut down the servers for a few hours in order to undergo maintenance. ChemCenter will endeavor to inform you previous to the date of maintenance about its time and duration by putting a notice on the web site. In the case of unexpected damages that are caused by nature, ChemCenter will make the best efforts to recover the damage in the shortest time possible. However, ChemCenter will not take any responsibility for customer's damages or complaints.